This article is part of a five-article series, inspired by my trip to the Mt. Everest Base Camp. This episode explores one of my most important personal philosophies when it comes to travels in general and hikes in particular. Travel these days is a strange thing. There is an expectation, almost, that each and every trip and adventure will be documented and shared on social media. There is, whether we like it or not, a certain level of social pressure for a travel show-and-tell; the phenomena of ‘pics, or it didn’t happen’. I think it’s a shame that many of us feel this pressure, real or imagined. Once in a lifetime experiences are definitely worth remembering. 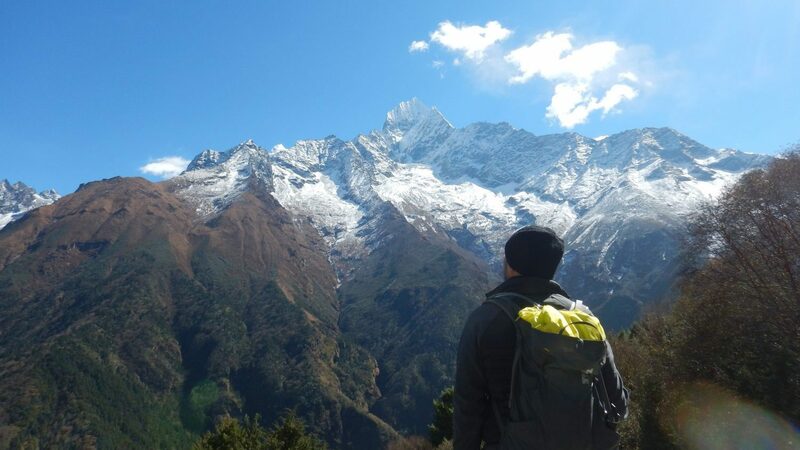 We set aside our hard-earned savings, our precious time, and sacrifice doing other things in order to visit a new country or hike up a famous trail. It’s absolutely understandable that each and every one of us want great photos from these events. What saddens me is when I see individuals live out many beautiful, precious moments mostly behind a camera lens or the screen of a mobile phone. Like many hikes in the middle of nowhere, the sky and the scenery can often be nothing short of magical. Everywhere you look is an Instagram super-content waiting to happen. And so many of us whip out our cameras and phones, looking to get “the perfect shot” – the ones that will get the most likes, comments, and compliments. But we must ask ourselves an important question: in the quest to capture a photograph, do we risk missing out on the moments that matter? I have been asked, in the past week alone, for photos and videos of my bucket list adventure on this hike. And that’s when I realised that I did not take that many shots. But what I do have are plenty of stories. I do not have a picture standing imperiously on a bridgehead, but that was the spot where I made new friends just by chatting about football. I do not have a picture with a massive mountain range behind me, but I spent a few minutes watching – and listening to – an avalanche crash down across the valley from me. I do not have a picture of the sun setting with the moon just above it, but at that moment I felt the world go from nice and cool to painfully cold. I am not for one moment suggesting that we stop documenting travels – far from it. What I am suggesting is for us to return from our experiences with more stories than pictures. We might forget where exactly a picture was taken. We might forget the name of the peak we snapped. We might forget the name of a local dish we had a couple of times. What we will never forget is how we felt, or what we were thinking or who we were with, during a special moment between ourselves and the wonders of this world. And those will be the moments that make us feel something. Those are the moments that matter. My hiking team is Trail Adventours, and our team members are: Guido Sarreal (leader), Angie Tan, Benedict Bautista, Eirene Bautista, Cathy Hermogenes (assistant leader), EJ Angeles, Geru Gotico, Saki de Leon, Joaquin Laurel, JP Yu, Jun Diaz, Katho Calma, Serge Divino, and myself. Featured image: teammate Saki de Leon gazing up one of the peaks along the trail. I suspect that this mountain is Kusum Kanguru (but I can’t be 100% sure). For photos and other stories of the trip, please visit my Instagram account, jsncruz.